Humans have two sets of chromosomes that are not connected in each cell. Am I correct? I assume while sequencing DNA both of these sets have to be sequenced and the output have to be provided in some order - i.e., paternal set followed by maternal or vice versa, though it may not be possible to know which is paternal and which is maternal. (I know there are different types of sequencing techniques and output may differ depending on the technique. Here I am speaking of the general case). I tried clarify this question myself. But may be this is such a basic thing that no one seems to touch upon this aspect. This is very similar to your previous questions, but apparently you are not understanding the explanations we are giving, so I'll try again, by giving a (hopefully not-too-technical) explanation of how next-generation genomic sequencing works. To avoid confusion, we'll assume we're working with human samples. First, many individual cells are collected (the number depends on the application, it can range from 1 cell to millions or more), and their DNA is collected. This process destroys the cells, and all of the copies of all of the chromosomes are mixed together. As mentioned in your other question, there is no possible way to determine which chromosomal sequence is maternal, and which is paternal. Scientists typically don't even think about this. Next, the collected DNA sample is purified and broken down into small pieces, then ligated to certain adapters to label them for the sequencing reaction. The sample is then amplified in a standard PCR to create starting material that is many times more plentiful than before. This is the DNA library. Finally, the sample is ready for sequencing. What exactly happens next depends on which sequencer you're using - Illumina, Ion Torrent, 454, or SOLiD are the most frequently-used instrument brands. Within each brand, Illumina for example, there are multiple different kinds of sequencing. However, we'll just gloss over all that and get right to the output - the instrument produces a file consisting of "reads" from the reaction. These reads are DNA sequences consisting of As, Ts, Gs, and Cs - the "letters" (also known as "bases") of DNA. The lengths of the reads vary by technology and instrument, generally in the range of 100 to 700 bases. One machine, though - the PacBio RS II, can produce high-quality reads up to 14,000 bases, although to my knowledge it is not in widespread use. Here is where the computers come in. The individual reads overlap each other to varying degrees, depending on the quality of information you're seeking and whether or not you're looking for rare events, such as a small population of mutated cells taken from a heterogeneous tumor. For our purposes, we'll say our sequencing run resulted in a 25-fold overlap, meaning each base in the original DNA sequence of the sample donor was sequenced an average of 25 different times. 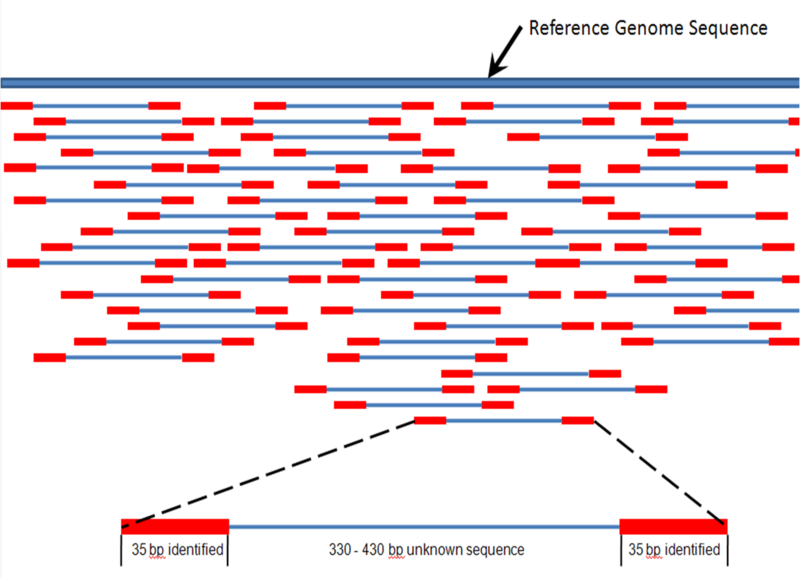 The computers can then "align" the sequences, either just among themselves, without a template, or, more commonly, to a pre-existing sequence template, such as a reference genome. Eventually, the computer will spit out two sequences - the forward and the reverse strand (although typically you'd just pick one strand, and use the reverse strand for error-checking). This sequence is the average sequence of the chromosome, or other region of DNA being targeted. However, one can pretty easily detect mutations, such as single nucleotide polymorphisms (SNPs), deletions, insertions, etc. In the case of a SNP (pronounced "snip"), one allele of a gene has one sequence on one chromosome (lets say ATTCGTAAC) while another allele of a gene on the other chromosome has a single-base change (ATTCTTAAC, for example, where the G was changed to a T). The point, directly relating to your question, is this: The final sequence that eventually comes out after all the computer wrangling is a single sequence with certain areas that may differ from chromosome to chromosome, or cell to cell in the original sample. There is no way to determine if the G in our example above was on the maternal or paternal chromosome. There is also no way to tell if, 20,000 bases down the line, another mutation is on the same chromosome as the G, because no single read can (currently) span that entire length. You might have a pretty good chance of determining that if the other mutation is, for example, 300 bases away, because many technologies can perform high-quality reads longer than that, so you'd just have to find the individual ones that contain both positions. I know this was a little long-winded, but hopefully I was able to answer your question. Not the answer you're looking for? Browse other questions tagged genetics dna-sequencing genomics or ask your own question.